Reuters is on a breaking news roll lately with ed tech. This time it is about Instructure filing for an initial public offering (IPO). Instructure is planning an initial public offering later this year that could value the education software company at $500 million to $800 million, according to people familiar with the matter. Instructure, based in Salt Lake City, has hired Morgan Stanley (MS.N) and Goldman Sachs (GS.N) to help prepare for the IPO, which has been filed confidentially, the people said. They requested anonymity because the news of the IPO was not public. Under the Jumpstart Our Business Startups Act, new companies that generate less than $1 billion in revenue can file for IPOs with the U.S. Securities and Exchange Commission without immediately disclosing details publicly. Instructure has long stated its plans to eventually IPO, so the main question has been one of timing. Now we know that it is late 2015 (assuming Reuters story is correct, but they have been quite accurate with similar stories). 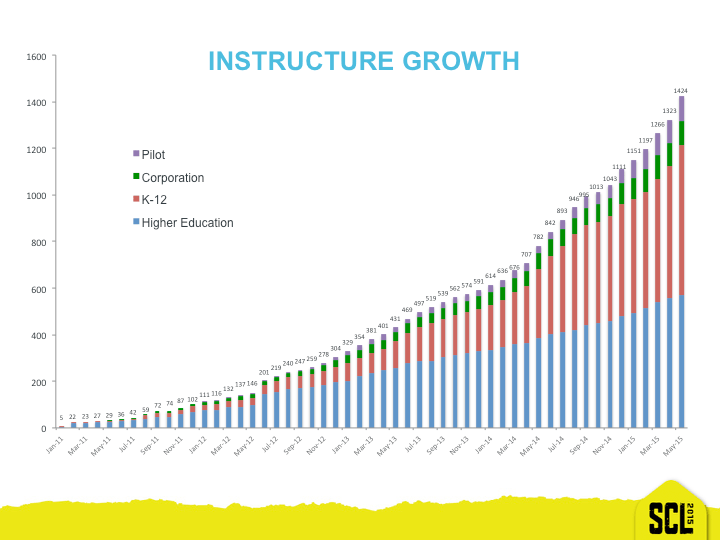 Michael and I have written recently about Instructure's strong performance, including this note about expanding markets and their consistent growth in higher ed, K-12 and potentially corporate learning. Taken together, what we see is a company with a fairly straightforward strategy. Pick a market where the company can introduce a learning platform that is far simpler and more elegant than the status quo, then just deliver and go for happy customers. Don’t expand beyond your core competency, don’t add parallel product lines, don’t over-complicate the product, don’t rely on corporate M&A. Where you have problems, address the gap. Rinse. Repeat. Instructure has now solidified their dominance in US higher ed (having the most new client wins), they have hit their stride with K-12, and they are just starting with corporate learning. What’s next? I would assume international education markets, where Instructure has already started to make inroads in the UK and a few other locations. The other pattern we see is that the company focuses on the mainstream from a technology adoption perspective. That doesn’t mean that they don’t want to serve early adopters with Canvas or Bridge, but Instructure more than any other LMS company knows how to say ‘No’. They don’t add features or change designs unless the result will help the mainstream adoption – which is primarily instructors. Of course students care, but they don’t choose whether to use an LMS for their course – faculty and teachers do. For education markets, the ability to satisfy early adopters rests heavily on the Canvas LTI-enabled integrations and acceptance of external application usage; this is in contrast to primarily relying on having all the features in one system. Combine this news with that of Blackboard being up for sale and changes in Moodle's approach, and you have some big moves in the LMS market that should have long-term impacts on institutional decision-making. Watch this space for more coverage.